Welcome back to the J&J Metro Moving & Storage blog! Nobody likes spending extra time cleaning before and after a move but, unfortunately, it is one of those necessary moving tasks that must be done. Getting an early jump on cleaning your office can make things much smoother before and after your move. As your trusted office movers in Orlando, we are here to provide you with helpful moving tips to make relocating your business all the more easy. 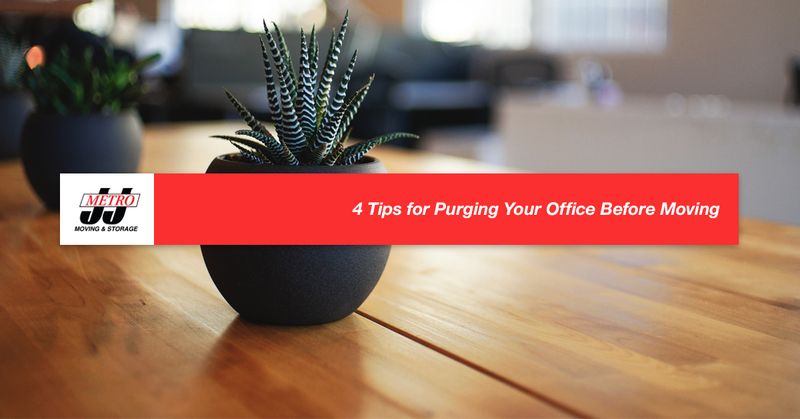 Therefore, in today’s blog post, we will look five tips for purging your office before the big move. Read on to learn more! Before you can even start tossing out old supplies and expired break room creamer, you should determine the goals you want to achieve with your office purge. The sooner you can start planning this, the better. That way, you can set small weekly goals which will make these much easier to achieve in the weeks before you move. Survey your office, workstations, storage rooms, and any other areas in your office. Next, grab a pen and paper and walk around your office to take an inventory of what you have. You can be as general or detailed as you’d like — the point is to start determining what needs to be cleaned now, what can go with your to the new location, and what to toss. First and foremost, you will want to communicate your moving goals with your employees. Make sure everyone is onboard with your plan as this will make it much easier to assign tasks to individuals. The last thing you want to do is to plan a last minute cleaning party and then nobody else shows up because you’re the only who got the memo. Send out reminder emails, chats, and calendar invites for mandatory and optional cleaning and moving events. You might even have a few poster-size signs made to hang around the office as reminders. If anything, you can ask your employees to thoroughly clean their desks and workstations before a move. Pro tip: you can always entice your employees to participate in the office purge with pizza! Take a good look at your file cabinets and storage areas. Go through your files and paperwork and determine what you need to keep and which outdated files you can shred. This may be a tricker task for businesses in the medical and legal fields, in which case, you may want to start on this task long before you relocate. The idea is to get rid of the stacks of papers that you no longer need so that you’re not cluttering up your new office with outdated files that will only take up space. Plus, stacks of paper and files get really heavy. If you’re using office movers who charge by weight, this could increase your moving costs significantly. Once you have taken an inventory of your office furnishings, you can determine which items could use an upgrade. Again, you don’t want to move a heavy, clunky refrigerator that you’ve had in your chiropractic office since 1985 that barely functions. While may not want to add to your moving expenses, relocating your business gives you a great opportunity to upgrade office furnishings that may end up saving you money in the long run. For instance, you can replace that run-down 1980s fridge with one that not only works better, but is energy efficient. Once you have purged your office, you can determine how much stuff you have left to move. Your next step should be to hire professional office movers in Orlando who can move all of your items safely. If you’re looking for a moving company with more than 50 years of experience in the moving industry, call J&J Metro Moving & Storage. Along with moving your belongings, we also provide storage units where you can store additional items for any length of time. Call our team today to request a quote for your move.